Shelf Reading – Burden or Blessing? She does not look thrilled. I think one of the problems I had with shelf reading is keeping the call numbers in my mind as I shuffled through the books. In an academic library, call numbers are LONG! 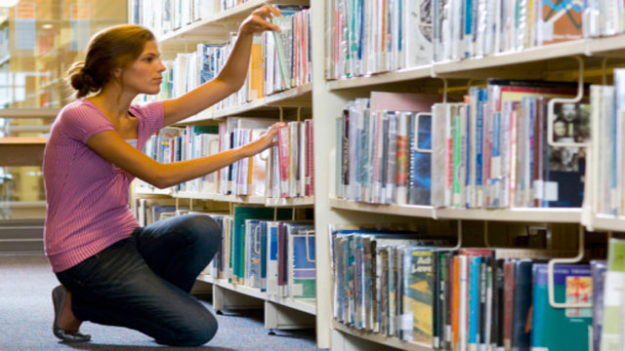 The massize size of many academic library collections necessitates using LC call numbers, allowing the level of detail contained in each call number to be very high. But your short-term memory has a limited capacity to accommodate these long numbers. Your mind can only keep about seven pieces of information (plus or minus two) in your working memory at any given moment. Here in GovDocs we use a modified version of SuDoc call numbers in our state and local collection, which gives you numbers like GV 10.8 M31 973/05. More than seven pieces of information there? Yes. And the lifespan of those seven pieces of info is only between 15 and 30 seconds. Space out for a second while shelf reading and it’s gone, and you’re flipping back and forth between books, wasting time. Talk about frustrating! With practice you can get a little better at keeping more information in your mind. But I’m excited about technology making shelf reading obsolete. This computer science professor came up with an app to shelf read for you – the catch is that each book must have a QR-like code on its spine. Meanwhile, do what I do or what this library director does. Turn shelf reading into a Zen experience by treasuring it as a quiet moment in your day. The conference is coming – and you should participate!